The above info came from Kirbyfan106, and was edited by yours truly (contact me). The image came from www.northarc.com. 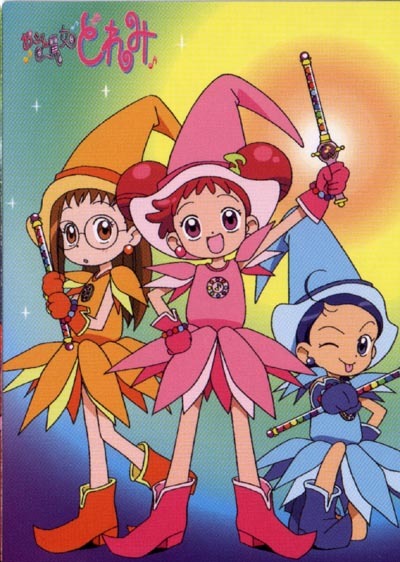 Magical DoReMi is an incredibly kawaii girl's show that is one of the most popular in Japan (besides Sailor Moon). Dorie, Reanne, and Mirabelle are three witchlings, witches in training, who have their very own magic shop, the DoReMi magic shop, formerly known as the Rusty Broom magic shop, which was owned by a witch named Patina. It was Dorie who turned Patina into a small green blob by calling her a witch, so now she and her friends are training to become full-fledged witches with help from Patina and her fairy, Lorelei. And while they do, they get into some mischief as well. 4Kids did not obtain rights to anything more than the first season of 51 episodes, and because of a dispute with Toei Animation over the alterations 4Kids made, Toei is unwilling to let them have more.